Experts expect the outcome of the fifth BRICS summit in Durban, South Africa to be the creation of a BRICS development bank to rival the World Bank and the IMF. However, China is already causing some concern, as it begins to use its economic dominance to angle for control of the future bank. The BRICS grouping is set to silence skeptics when the leaders of the five emerging economies walk the talk and unveil the establishment of the South-South Development Bank in the coastal city of Durban, South Africa. The bank is a potential game-changer in the grouping's larger, strategic objective of leveraging the South’s growing economic heft to democratize global institutions of governance and challenge the hegemony of the Western-dominated Bretton Woods twins (the IMF and the World Bank). Indian officials familiar with the latest developments have disclosed that, despite some differences on some issues related to modalities of the bank, the eThekwini Declaration will unveil the setting up of the BRICS bank and underline that it is “workable and feasible.” The declaration will also spell out a broad, overarching vision of the bank as a catalyst for infrastructure-building in Africa and in the global South. South African President Jacob Zuma has struck an upbeat note about the prospects of the BRICS development bank, which is poised to be the showpiece outcome of the fifth BRICS summit. “BRICS is not a talk show. 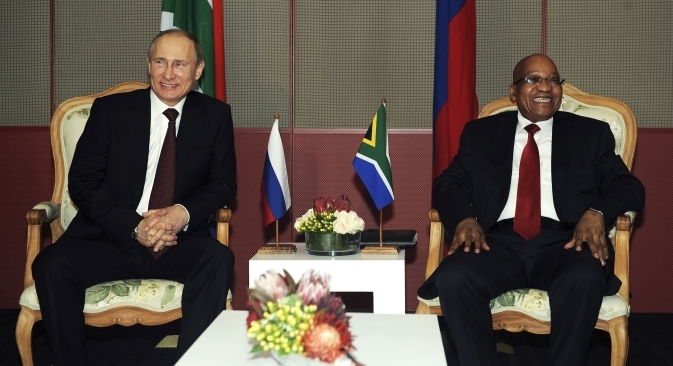 It is a serious grouping,” Zuma told reporters on March 25, at the presidential guesthouse in Pretoria. “We are able to discuss things and make decisions. If, for example, we talk about the eminent establishment of a development bank, we discussed this a while ago and immediately charged our finance ministers to work on a modality. We are now ready to launch it,” said Zuma. Chinese President Xi Jinping has also voiced hopes for “positive headway” in establishing the bank. Yet negotiations go down to the wire at the meeting of the BRICS finance ministers in Durban, which are focusing on resolving key issues related to the governance and functioning of the bank. In fact, a subtle power play and jousting for influence has begun, with Beijing flaunting its considerable financial muscle in a bid to control the bank and assert its preeminence as the most powerful economy in the grouping. The negotiations on modalities of the bank will, therefore, require intense and deft diplomacy. According to Indian officials, the finance ministers may make recommendations for setting up the bank and its role, but they could probably leave key issues like the corpus of the bank, governance structure and voting rights to be decided over the course of the next year. These issues may ultimately take up to one year to decide, and the bank may take two to three years to become functional, say Indian officials. The bank, therefore, can be expected to become functional only in 2015-2016. It will require the close-knit solidarity and congruence of perspectives among BRICS countries to make it work. There could, however, be a last-minute breakthrough on the initial corpus of the bank at the finance ministers’ meeting in Durban. The finance ministers of the five countries are keen to agree on a fixed corpus amount — a key step that will enhance the credibility of the bank and get a powerful message across that BRICS means business. Indian officials report that India is in favor of the initial capital of $50 billion to launch the fund, with equal contribution of $10 billion from each BRICS country. China, the world’s second largest economy and the BRICS’ largest economy ($3.2 trillion in foreign exchange reserves), is plugging for a $100-billion corpus fund. China’s ambitions to control the bank has caused some concern in New Delhi — especially after Beijing indicated that it is ready to pay up a part of the share of countries like Brazil and South Africa, which cannot afford a huge funding commitment. India is expected to oppose the Chinese proposal, as a bigger share of funds will give China greater voting rights in the new bank and provide a control for Beijing to set the agenda. This would negate the ethos and basic principle of equity that underpins the proposed new bank, say Indian officials. India, Asia’s third largest economy, will be proactive in shaping the modalities of the bank, ensuring that Beijing’s ambitions do not subvert the core principle of equity and the larger strategic objective of democratization of international institutions of economic governance. There is a growing consensus that the new bank should not duplicate the asymmetries of the World Bank and the IMF. To resolve issues related to the corpus fund of the bank, India has suggested that all BRICS countries be required to put in equal contributions and have the same quota of votes; in addition, the bank could open its membership to advanced economies, in order to plug the shortfall. By this scenario, while the BRICS would collectively put in 70-80 percent of votes and funding, outsiders could be allowed to contribute funds. While the modalities of the bank could take up top 2-3 years to become operational, there is a broad consensus on what the bank will do. All BRICS countries are more or less on the same page about the core function of the bank. The bank’s primary role will be to spur infrastructure-building and development in the emerging countries and the larger global South. More importantly, the bank will act as a defender and guarantor of interests of developing countries. It is likely to accelerate the reform of the Western-dominated, global financial-governance institutions, in order to accommodate the surging aspirations of the developing world. The leaders of BRICS countries will also be pushing for a higher voting quota for developing countries in Bretton Woods institutions, as well as the reform of the UN Security Council. Manish Chand is the editor-in-chief of India Writes, an online journal focused on international affairs, the story of India and promoting dialogue among cultures. He is currently in Durban to report on and analyze issues and outcomes of the fifth BRICS summit.